Best Shampoo For German Shepherds - Keep Your Looking Their Best! You are here: Home / Reviews / Best Shampoo For German Shepherds – Keep Your Dog Looking Their Best! Best Shampoo For German Shepherds – Keep Your Dog Looking Their Best! The best shampoo for German Shepherds will keep them clean, and their fur healthy too. We’ve taken a look at the top choices, and found the best brands for your dog. The German Shepherd is one of the world’s most intelligent dog breeds, coveted by law enforcement officials, military personnel, and families alike. This breed is a working dog at heart, but it can also make a fabulous companion. However, German Shepherds are high-energy dogs who shed often and love to get messy. Are you prepared for the upkeep of a German Shepherd’s coat? Do German Shepherds Need Shampooing? 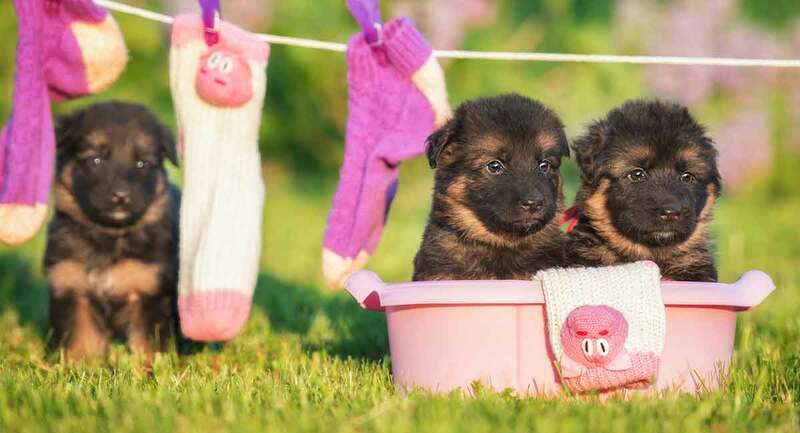 German Shepherds have profuse coats and naturally oily skin, and while they don’t need to be bathed very often, they will still benefit from an occasional bath. This is good news, considering the German Shepherd’s outgoing and playful personality! This is a breed who loves to dig, and he has been known to dig through anything from dirt, to mud, to snow. Not to mention the German Shepherd is an athletic breed and will likely enjoy long runs, dog park outings, and even playing in the water. With this in mind, your naturally curious and outgoing German Shepherd might leave the house clean and come home a mess! What Type of Fur Do German Shepherds Have? German Shepherds have a very thick, double layer coat. They are high shedders and some German Shepherds can have longer hair than others, but for the most part, their grooming and bathing needs are the same. According to the American Kennel Club, German Shepherd dogs need to be brushed daily to keep any loose hair under control and to help rid the fur of excess dirt and debris. How Often Should You Shampoo a German Shepherd? If your German Shepherd has a healthy coat overall, then the American Kennel Club recommends bathing him just once every four to five months. If you over bathe your German Shepherd, it could deplete the natural oils his skin produces that help to keep his fur healthy. However, if you do not bathe him enough, the oils on his skin can accumulate and lead to doggy odor and an unhealthy coat. Now, let’s take a look at some of our favorite shampoos for German Shepherd dogs. Even though German Shepherds produce natural oils that help promote healthy skin and a moisturized coat, you should still seek out a high-quality dog shampoo packed with natural ingredients that help promote a healthy PH balance and essential oils to ensure skin and fur health. One of our favorite German Shepherd-approved shampoos with all of these qualifications is the 4-Legger Certified Organic Dog Shampoo. This dog shampoo is made with aloe and lemongrass to help calm and sooth a number of different skin types. And because of it’s gentle, natural ingredients, it is great for sensitive skin as well. Certified organic and recommended by both groomers and veterinarians alike, this is a top choice for many German Shepherd owners! We are totally in love with the Pupkiss Pets Professional All-in-One Natural Dog Shampoo for Healthy Skin & Coat. Made from plant-based materials, the Pupkiss Pets Complete Care All-in-one Pet Shampoo helps to clean your German Shepherd’s skin and coat using ingredients like coconut and palm oil. Other ingredients also include some of our already mentioned favorites for dry and itchy skin like oatmeal and aloe. One of our favorite things about this brand is that it can be used on dogs with especially sensitive skin and can be a relief for dogs with skin allergies, flea bites, and other sensitivities. Earthbath All Natural Pet Shampoo is another dog shampoo product we recommend for German Shepherd dogs. With nearly five stars on Amazon and over 2,500 reviews, this product has been tried, tested, and approved! This is a soap-free shampoo which means very little residue will be left behind after rinsing, and it is formulated with soothing ingredients like aloe and oatmeal to ensure your German Shepherd’s skin and coat are left soft, shiny, and moisturized. Another brand that uses oatmeal and aloe is the Healthy Breeds Oatmeal & Aloe Dog Shampoo. This brand is both hypoallergenic and pH balanced for the best results and is great for those dogs with extra sensitive skin. The mild formula helps to relieve itchy, dry skin while reducing leftover residues and ensuring a shiny, healthy coat long after the bath is over. Burt’s Bees for Dogs Oatmeal Shampoo is yet another brand we can’t get enough of. This all-natural dog shampoo is made without dyes, sulfates, or parabens, and is enriched with oatmeal to help alleviate any dry, itchy skin under your German Shepherd’s thick fur. This shampoo is so gentle, in fact, that it is great for all breeds and even puppies! So, now that we have covered some of the best shampoos for German Shepherd dogs, let’s talk about how to properly bathe and shampoo a German Shepherd. Most German Shepherds are equipped for a number of different weather conditions, however, you should still try to bathe them with warm, never hot, water, unless it is particularly hot outside and you feel comfortable using a hose. Remember, it is always best to brush your German Shepherd before bathing him, especially if he has long hair. Long-haired German Shepherds can be prone to knots and tangles, which will be difficult to get out once he has been bathed. German Shepherds are also heavy shedders, and you will get the best clean if you brush out any loose hair, dirt, or debris before bathing him. Once you have your German Shepherd brushed and ready for his bath you will want to thoroughly wet him so that any shampoo you lather him with can be worked into his dense, double layer coat. Use a generous amount of shampoo and make sure you scrub him efficiently with your fingers, ensuring that you work the shampoo down to the skin. Take care not to get any product in your dog’s ears and eyes, as leftover shampoo residue can cause irritation, inflammation, and sometimes even infection. Once your dog has been thoroughly shampooed, it’s time for his rinse. Many experts point out that the rinse is one of the most important parts of a German Shepherd’s bath time. That is because if you do not properly rinse the shampoo from your German Shepherd’s fur, leftover shampoo residue can dry and cause skin irritation and coat damage. Once your dog is rinsed, you will follow through with the conditioner. Again, you will rinse him thoroughly before towel drying him. If it is chilly and your dog will tolerate it, you may attempt to blow dry him. Pay special attention to his ears to ensure you have gotten any excess moisture and product residue out. Keep in mind that excess moisture buildup can cause ear infections in your German Shepherd’s especially deep ear canal. If you are new to bathing a German Shepherd dog and would like to see a video of a professional washing a German Shepherd, we have you covered. Remember, not all shampoos are created equal, and just because a shampoo claims to be dog-friendly, that doesn’t mean it is good for your German Shepherd. The best types of shampoos for German Shepherd dogs are going to be shampoos that have high-quality ingredients and are formulated to promote a healthy pH balance as well as to protect the natural oils in your dog’s skin. Some of the best ingredients in dog shampoos for you to keep an eye out for are oatmeal, coconut, certain oils, and aloe. Steer clear of shampoos with unnecessary additives like dyes and parabens, or shampoos with high alcohol content. Alcohol is an additive commonly used in products like shampoos and conditioners, and it can be especially harmful to a German Shepherd’s sensitive skin by drying out the fur and reducing the natural oils your German Shepherd produces on his own. And remember, never over bathe your German Shepherd dog. If he gets messy, the best course of action, according to experts, is to wipe him down with a wet rag and give him a nice, thorough brush through. Do you have any favorite dog shampoos you think should be on our list of favorites for German Shepherds? Jennifer Miller, 6 Tips for Grooming Your German Shepherd Dog, The American Kennel Club. Eugene A. Carver, Coat Color Genetics of the German Shepherd Dog.